Anti-Arab racism has been around for a long time, growing initially to justify European colonialism and later American imperialism, including the Israeli occupation of Palestine. For the past several decades, there have been a number of pivotal events that have sharply shaped the public discourse in regards to Arabs and Muslims. With the Iranian revolution in 1979, the discrimination was broadened to all Muslims since Iranians aren’t Arabs. One of the most effective campaigns of Islamophobia revolved around the Ayatollah Khomeini’s infamous death fatwa against Salman Rushdie in 1989. The portrayal of Muslims as bloodthirsty, violent, and intolerant grew considerably. The Iran-Iraq war followed the Iranian revolution, with the United States and its allies intervening heavily on behalf of Iraq, as well as the U.S.-backed invasion of Lebanon by Israel to destroy the Palestine Liberation Organization (PLO). Add to this Israel’s bloody suppression of the first Palestinian intifada (1986), the first Gulf War in 1991 (to dislodge the West’s former ally Saddam Hussein from Kuwait), and the UN sanctions against Iraq which were responsible for the death of hundreds of thousands of Iraqis, and there is the context or fertile ground for the growth in terrorist attacks against the U.S. which culminated in the September 11th 2001 attacks. Islamophobia has reached new heights in the United States since the attacks, helping to justify and sell a war and occupation of Afghanistan (a war which is increasingly spilling over into Pakistan), another war on Iraq, and the U.S. and its allies intervening militarily in three more Muslim countries: Yemen, Somalia, and Libya. Alongside all this, of course, has been the destruction of civil liberties. In 2011, however, the view of Arabs and Muslims by the world finally began to change. They stood up to and brought down two of the world’s most brutal regimes that were, not surprisingly, backed by Western governments. 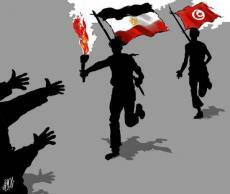 Despite massive repression, they have continued to fight to bring down the other Arab regimes. Thousands have been beaten and killed in the process. Over 5,000 have died in Syria alone, and hundreds have given their lives in Egypt. The uprising in Bahrain, a major ally of the U.S. and home to the U.S. Navy’s 5th Fleet, was brutally suppressed. These struggles inspired protest movements around the world, including the Occupy Movement here in the U.S. That’s why it is essential that we continue to stand in solidarity with the Arab uprisings. Alongside the 1-year anniversary of Bouazizi setting himself on fire is the 3-month anniversary of the Occupy movement, which began with Occupy Wall Street (OWS) on September 17th. We have seen encampments emerge in dozens of cities nationally and internationally. With the dismantling of many of the encampments, often through a violent crackdown, the movement has reached a crucial turning point. The momentum has inevitably slowed down, though Occupy actions and meetings still frequently occur. This is a valuable time to think about the next steps for the movement and what might be possible for the spring and summer. We have a long way to go, and really, what we’ve seen so far is only the beginning of the beginning. We do not have the tens of thousands coming out en masse onto the streets day after day for months like in the Arab world. Ultimately this is what it takes to bring down a corrupt system. That’s why the Occupy movement needs to continue to build and grow. Within the past week, momentous events have come to pass that Occupy protestors must take note of. The United States government has officially ended the war in Iraq. After nearly 9 years and potentially over a million Iraqis losing their lives, we are told the war is over, though Baghdad will have the largest American embassy in the world, and thousands of “consultants” and private contractors will remain in the country. The War on Terror has significantly drained US resources and has compounded the financial crisis, thus links must be made: Wall Street $ = War $. President Obama has also said that he will sign the National Defense Authorization Act (NDAA). Under this law, anyone, in any part of the world, who is deemed to be a terrorist can be thrown into indefinite detention, without charges, much less a trial. This includes American citizens. The passage of this horrifying bill codifies practices that the Obama administration has already undertaken. The NDAA is a law that should be of concern to all, particularly those involved in Occupies in the U.S., because the government can use it to label anyone who opposes American policies as a terrorist and detain him/her indefinitely. The bi-partisan support of the bill is further proof that the two political parties are more similar than they are different, and that we cannot afford to get tied down into the awful election cycle. Our president just made all of us a target. He must be held accountable for his actions; it is imperative that we resist the passage of such legislation. And so, this is the winter of our discontent, one that started a year ago with a 26 year-old man named Mohammed Bouazizi in Sidi Bouzid, Tunisia setting himself on fire as a wake up call to the world. We need to continue to remember his sacrifice, and all that we have learned this year from Arab revolutionaries like Bouazizi. Regimes have been toppled, thousands have given their lives, governments are in crisis - and yet people continue to push for more change. In 2011 we no longer waited for change to come to us, but rather knew that "We are the ones we have been waiting for”.